Primrose Hill, home to the Princess of Wales pub, is one of London's most desirable areas, and the well-preserved Victorian streets are a joy to stroll around. The area is named for the adjacent park where the gently rising Primrose Hill affords excellent views across London's skyline with the London Eye, St Paul's and the newly built, 310-metre tall Shard all clearly visible. Present and current residents include Ed Miliband, leader of the Labour Party, Boris Johnson, Tory Mayor of London, John Cleese and Kate Moss. None of them were in the Princess of Wales when I popped in one Sunday after a walk around the park, which is just a couple of hundred metres from the pub. This elegant Victorian boozer was built around 150 years ago and it's had a recent makeover that's combined preservation of original features with some contemporary styling. The result of the face-lift is pleasing since the basic character of this historic building is allowed to shine through. Downstairs, the main feature is a large, central bar in the centre of things while upstairs there's a light-flooded dining room with fashionably mismatched chairs and natural timber flooring. Exuberant wallpapers and clever paint schemes and effects complete the look. We were too late to catch the Sunday roast that's served every week from 2 to 4pm, although we did chance upon the tail—end of the live jazz that accompanies the meal. I enjoyed that with a pint of London Pride, a really decent cask ale, while my partner gave the thumbs up to a glass of prosecco. Food is a key element at the Princess of Wales and the menu offers a modern take on standard British pub food with an emphasis on careful sourcing of ingredients. Pork pies come from Nottinghamshire, delicious chorizo, slightly confusingly, from Bath, and ham from Trealy Farm in Monmouthshire. Other items on the menu include stone baked flat breads, a kind of squarish pizza, Beef Flank & Kidney Pie with mash and gravy, and Chargrilled Spring Lamb Chops with roasted garlic and salsa verde. 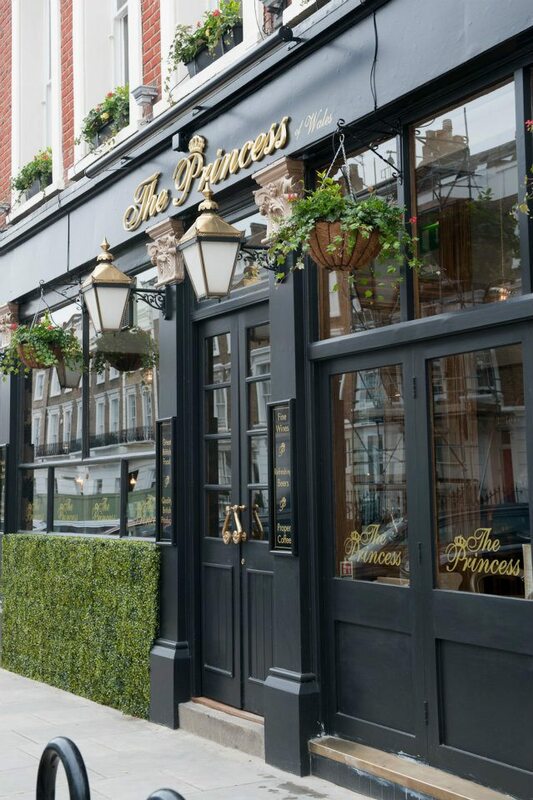 The Princess also does breakfast with choices like Creamed Mushrooms on Toast or Eggs Benedict, and there's a short children's menu for a reasonable £6. It's a pleasure to come across a pub that's brought itself into the 21st century with well-chosen decor and a menu that's aimed at the customer rather than dictated by the chef's ego. Happily, the Princess of Wales still has the feel of a friendly local in a city that's lost far too many of its traditional pubs.